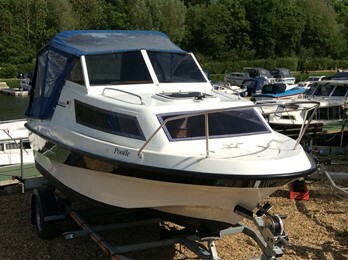 This shetland Family 4 is a very well maintained example of this popular day boat weekender. 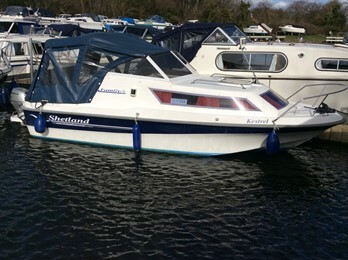 The Shetland family 4 is a great starter boat for inland use. 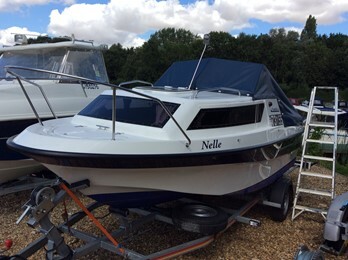 The craft offers a large social cockpit together with overnight accommodation. This craft was a development of the very successful Shetland 535/536 and offered a cabin layout to include sufficient cockpit length to incorporate side benches/2 single berths. This fit and finish was more sophisticated over its predecessor. The original craft features a conventional outboard well built into the transom. Later designs build to date feature a moulded outboard pod/transom platform. This allows for a larger cockpit with wrap round seating to the stern. An older version of the Shetland Family 4 was built between the years 1978-1996 without the pod that measured 17ft 5ins/5.37m.